Romero, vying to be the Mariners’ right-handed bat off the bench and backup first baseman, is hitting .480 this spring with two doubles, a home run, seven RBI with a .500 on-base percentage. 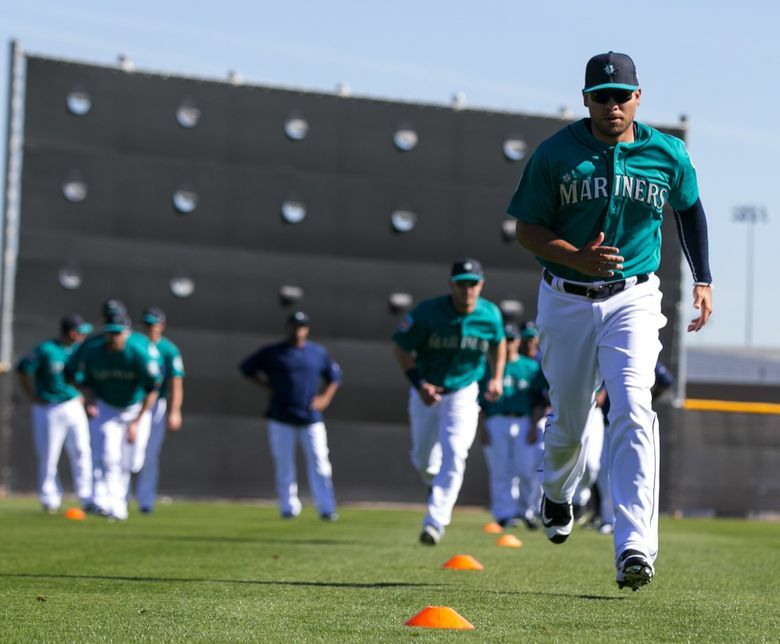 TEMPE, Ariz. — With a maturing approach at the plate that has resulted in line drives being sprayed around Cactus League parks, Stefen Romero has forced his way into the conversation for the Mariners’ right-handed-hitting backup/platoon spot at first base. The competition had seemed to narrow into a two-person race between Dae-Ho Lee and Jesus Montero. Now Romero is in contention for one of the few openings on the Mariners’ projected 25-man roster. 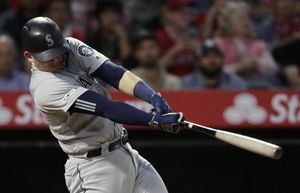 “He’s swung the bat really well, and he’s certainly in the mix for that spot,” manager Scott Servais said before Tuesday’s game against the Angels at Tempe Diablo Stadium. Notable: At Tempe Diablo Stadium, it appeared Dario Pizzano would be the hero for the Mariners. The outfield prospect hit a solo homer in the top of the ninth inning to break a 3-3 tie and put the Mariners up 4-3. But teammate Jonathan Aro couldn’t hold the lead in the bottom of the inning, giving up a leadoff triple to Craig Gentry and a one-out sacrifice fly to Geovany Soto that tied the score. The teams chose not to play extra innings. Player of the game: Designated hitter Dae-Ho Lee went 2 for 3 with an RBI single and a double. Lee raised his average to .286 this spring. Quotable: “We did some good things offensively today. Dae-Ho Lee swung the bat well. He had a nice double against Joe Smith, who is an accomplished big-league reliever and is tough on righties. 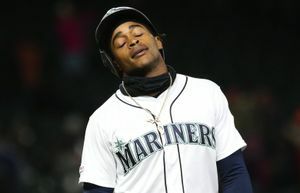 So there were some good things.” — Manager Scott Servais. On tap: The Mariners return to Peoria Stadium on Wednesday to face the San Francisco Giants. Right-hander Hisashi Iwakuma will make his third start of the spring, and the Giants will go with right-hander Jeff Samardzija. First pitch is at 1:10 p.m., and the game will be televised by ROOT Sports. Romero strengthened his position in the game, going 3 for 4 with three singles and a hard line-out to left field in his final plate appearance. He’s hitting .480 (12 for 25) this spring with two doubles, a home run, seven RBI with a .500 on-base percentage. Romero always has been an aggressive hitter. In past years with Class AAA Tacoma, he loved to ambush first pitches. It helped him succeed there. He’s a career .296 hitter with an .843 OPS in 245 games with the Rainiers. But he has refined his knowledge of the strike zone and controlled the aggression, knowing it was necessary to succeed at the big-league level. He struggled when given a similar platoon role in left field to start the 2014 season, hitting .192 with a .533 OPS in 73 MLB games. He realized he needed to adjust. Romero isn’t up there looking for walks; he wants pitches he can hit as hard as possible. That approach works for Servais. In the field, Romero had an error-free game at first base and made a beautiful diving stop on a ground ball down the line off the bat of Daniel Nava in the bottom of the second. Romero scrambled to his feet and touched first for the third out. Romero wasn’t surprised he made the play. He isn’t a complete novice at first base. Sure, he’s played the position in only five games — three starts — in his professional career. But at Oregon State he usually started at third base and played first base often. Romero is playing so well that even his remaining minor-league option might not be a hindrance. Montero is out of options, and Lee has an opt-out in his contract for the end of March. Sending Romero to Class AAA Tacoma as an insurance policy and giving Lee or Montero a chance would be a common baseball move. But Romero is playing better than his competitors, and his ability to play both corner-outfield spots and run the bases at a better level gives him a different advantage.